1st Ever @sillyauntjen Lego Tweet-away! What is a tweet-away you might ask? It started out as an idea I had as a way to say ‘THANK YOU!’ for helping me (@sillyauntjen) reach 1000 followers on Twitter. 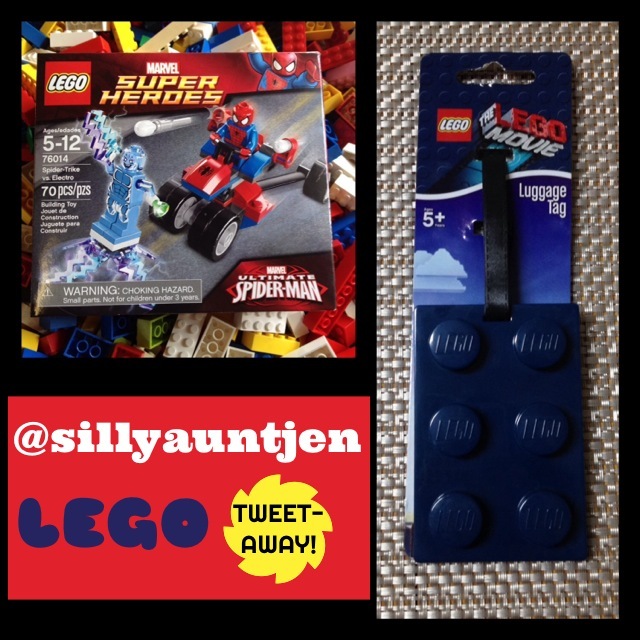 To spread the word, and the fun of course, I decided to tweet out my first giveaway: a Lego prize pack including the Marvel Super Heroes Spider-Trike vs. Electro set along with a special edition The Lego Movie Luggage Tag. You see, I am a Lego Engineering Instructor. Yes it is a real job, and yes it is just as awesome as it sounds. (“EVERYTHING IS AWESOME!“) For the past 3 1/2 years, I have had the great fortune of teaching kids STEM concepts through building and playing with Lego creations. Basically I have every kid’s dream job! Because playing with Lego has become such a huge piece of my life, and such a joyful one at that, I have decided to share the fun! After all, we are just all kids at heart, right?! There is still time to get in on the Lego tweetaway. The only stipulations for entry are that you follow me (@sillyauntjen) on twitter and that you RT (retweet for you newbies) THIS CONTEST POST. A winner will be chosen at 10pm PST on May 26, 2014. Good luck, and keep your eyes peeled for future fun tweetaways! Tags: engineering, fun, giveaway, Lego, Marvel, social media, Spiderman, STEM, Superheroes, The Lego Movie, tweetaway, twitter. Bookmark the permalink. Previous post ← Glamour Glasses – $2 Target HACK!